Nintendo gives four old school games a fresh coat of paint. The question is, should you care? Somewhere in the raging heart of the eighties gamer there will always be a special place for Nintendo's ultra-basic, pre-Game Boy handheld gems. 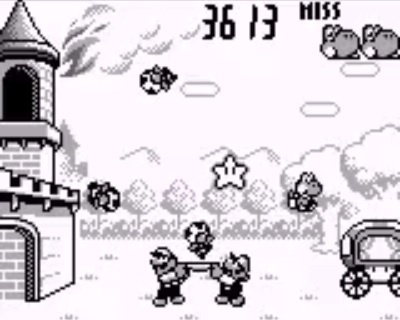 Simple, addictive, and designed to fill a few spare playground minutes, the Game & Watch games worked around their hilarious technical limitations with typical Nintendo class. When this Game Boy release originally appeared in 1997, most of us were still high on our first gaming nostalgia trips, and this four-title collection tapped into that giddy fervor perfectly. 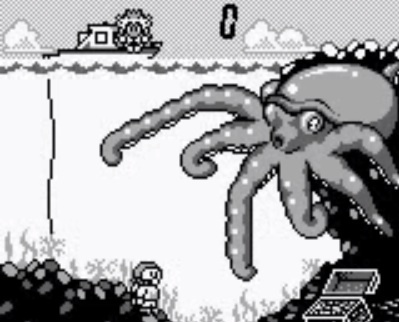 But rather than just lump together a stodgy compilation of monochrome LCD relics, Nintendo took the opportunity to revisit the game mechanics and produce updated versions of Manhole, Fire, Octopus and Oil Panic to stand alongside the fun-but-limited originals. In Manhole, for example, Yoshi stands in as the lead character, using his prehensile tongue to prop up four manhole covers to provide safe passage for passing pedestrians. It's as daft as a brush, but has all the throwaway charm of today's score-chasing mobile games. And it's the same deal elsewhere, with Fire transformed into an excuse to press Mario and Luigi into action as they bounce fleeing civilians to safety as they leap from a burning building, while Oil Panic has you delicately redistributing drops of oil into Yoshi's gaping maw as he prowls the platform below. Octopus, meanwhile, is probably the most imaginative of the lot, as you dive for treasure while trying to doge between the grasping tentacles that stand between you and untold riches. Each comes with Normal and Hard modes to test you with, and all are the kind of game that, these days, probably won't engage in the way that they once did. Back then, you most likely got one for your birthday and had to damned well make the most of it. But in today's era of cheap, disposable handheld gems at every turn, the point of the Game & Watch Gallery will be lost on all but the most wistfully nostalgic. It's not the games' fault, but things have moved on to such an extent that this serves as a little more than a curiosity, and a reminder that some of us really should probably get over our childhood by now. What's Hot: Four re-imagined games, stars popular Nintendo characters, costs $2.99. What's Not: Quite shallow, grows boring quickly.